Recorded on two separate dates in October 1965, ‘Cape Verdean Blues’ was the first full album recorded with his new band, though the second session added J J Johnson to the line-up. 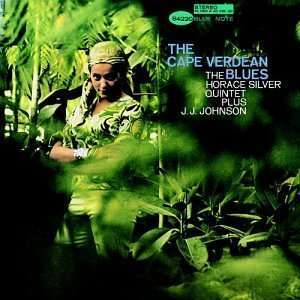 ‘Cape Verdean Blues’ captures Horace Silver’s writing at its best; the title cut in particular blends Latin, Calypso and Hard Bop with consummate ease. Horace Silver’s musical persona is multi faceted; take for example ‘Pretty Eyes – a waltz that the band tackles with a minimum of fuss. ‘The African Queen; is a solid and tough blues, where as the aptly titled ‘Nutsville’ displays the quizzical sense of humour that Silver has. Jazz, Silver style is fun. The addition of Joe Henderson on sax and Woody Shaw on trumpet give ‘Cape Verdean Blues’ a mid 60’s Soul Jazz feel with just a touch of the new breed with which these players experimented. This is an essential contribution to Horace’s discography.